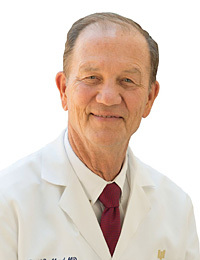 David W. Burkland, M.D., FACS is board certified by the American Board of Surgery, and has been practicing at White-Wilson Medical Center for 40 years. Yes, we said 40 years!! In fact, Dr. Burkland has been practicing with White-Wilson longer than any other physician. Dr. Burkland received his medical doctor degree from the University of Illinois in Chicago, IL. After graduating he went on to complete his residency at the University of Miami in Miami, FL in General Surgery. Dr. Burkland is also affiliated with the Emerald Coast Surgery Center, which was voted the Best Surgery Center in Destin in 2015 and Best Surgery Center on the Emerald Coast in 2016. Dr. Burkland specializes in General and Vascular Surgery, and performs a wide range of surgeries from abdominal surgery to pacemakers, endovascular stents, to thyroid and parathyroid surgeries. Dr. Burkland is passionate about providing quality care, and enjoys the beautiful Emerald Coast lifestyle with his wife and family.